Whatever your favourite fruit, the chances are it can be added to sugar free biscuits. 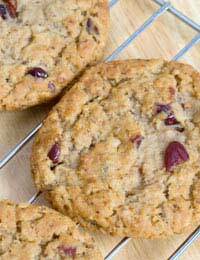 Dried fruit in biscuits can not only help to sweeten the snack but can also add an enjoyable chewy quality. In some recipes, fresh fruit can work well too. Try combining fruit with different spices to create a variety of flavours for your biscuits. Instead of sugar, in some recipes you can also puree fruit and use it as your sweetening ingredient too. Cranberries have all sorts of great health benefits. The handful or so you add to these biscuits also gives them a little more bite. Preheat your oven to 180 deg C/350 deg F/gas mark four. Take your sugar free strawberry jam and cream with your margarine, until light and fluffy. Beat your egg and stir into your margarine and sugar free jam. Add your dried cranberries and ground almonds. Stir well. Sieve your plain flour and baking powder, and stir in until you have a light dough. Dust a surface with flour and roll out. Using a circular cookie cutter, cut into shapes. Place on a greased baking sheet and place in the centre of your over. Bake for about 20 minutes or until golden brown. These very fruity biscuits have a distinctly Christmasy flavour. Try candied peel and currants as suggested here, or add glacé cherries or sultanas. Preheat your oven to 180 deg C/350 deg F/gas mark four. Melt your honey and butter in a small pan over a low heat. Sieve your flour and allspice into a bowl. Stir in the hot melted liquid. Beat your egg in a small bowl then stir that in too. Add your currants and candied peel. If need be add a splash of milk. Roll into a dough, wrap in cling film and place in the fridge to chill for an hour or so. Then lightly dust a clean surface with flour and roll out to about one and a half cm thick. Cut into shapes, place on a lightly greased tray and bake in the centre of the oven for about 10 minutes. Remove and leave to cool. This recipe calls for very ripe bananas as a sweetener. Unless you have a very sweet tooth, this should be sweet enough to compensate for the lack of sugar. Preheat your oven to 180 deg C/350 deg F/gas mark four. Peel your bananas and puree until smooth. Beat your egg and stir in. In a small saucepan, melt your butter over a low heat then add to the banana and egg. Add a teaspoon of vanilla essence. Wash and hull your strawberries then chop into small pieces. Stir these in too. Sieve your flour and baking powder into the batter. Stir until your have a dough-like mixture. Take small scoops of the dough, roll in your hands into small balls then carefully place on a greased baking tray. Press down on each with a fork. Place in the centre of the oven and bake for about 10 minutes. Remove and leave to cool.